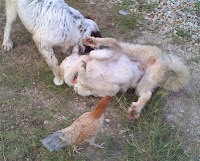 Yo, pups: the poultry pen is on the OTHER side of the house! Sheese! 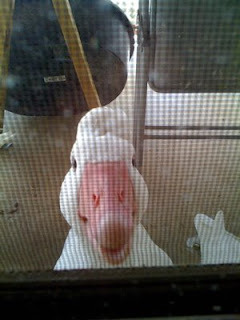 Pic o' the weekend: Goose! I love the weird perspective in this photo. 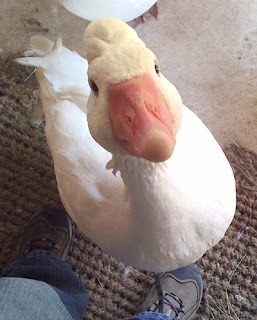 Goose head, to body, to my feet. Plus, Godzilla looks like such a sweet boy in this photo! "There's much that I'd like to get done around the house after work today, but little that is absolutely necessary. Dishes are piled up in the sink, and the floor needs to be swept and mopped, but the more I've had to do around the property, the more I've had to let go of expectations of organization. This isn't to say that I don't do any housework; it's just that I'll often wait until Spouse comes home on the weekends to help, or I'll shove stuff off until it becomes unavoidable. I miss having a consistently clean house. But I love the land, critters, and good sleep much more." Are they... are they starting to get it? They still get "the puppy stoopids" every afternoon, where anything and everything within a 20 foot diameter radius is manic fair play, but I've caught the pups actually GUARDING the geese and chickens several times these past few days. Hanging out, peacefully watching the poultry, looking over the land, and jumping up and chasing off whatever seems to be encroaching on their territory - whether it be the neighbor's dog coming up to the fence 50 yards away, or the dragonflies getting a wee bit too close for comfort. 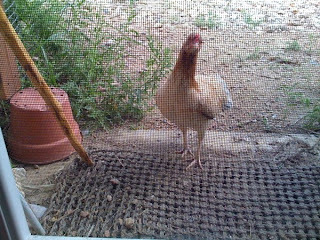 It will be several months yet before they can be trusted full-time around the poultry, but I'm heaving a big, hopefully-not-premature sigh of relief. It looks like (fingers crossed) their guarding instincts are starting to kick in. 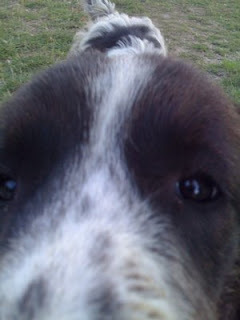 And the really bad puppy stoopids only seem to happen when I'm around and they're showing off. Several mornings I've come in from work to find that one or more of the chickens have hopped over the electric netting - they jump up on the goose kennel then fly over - and so far the dogs haven't payed them any specific attention. 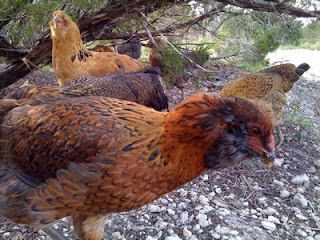 Or the chickens are getting wily enough to outrun them. Keeping fingers crossed, knocking on wood, and saying prayers that good behavior continues and grows, as I can't move that #@$! goose kennel until Spouse gets home from business travel many days from now. Stay good, doggies... stay good. I heard the call of the afternoon flight practice, and turned to watch. During flight practice, the geese will tear off running down the small hill of our yard with wings a-flapping, then stop at the bottom of the hill, turn around, and flap/run back up to the top. Looks like a nice workout, even if it doesn't amount to much more than than, well, wing flapping, honking and sprinting. From someone who has trouble chewing gum and walking at the same time, believe me, I'm not making fun (okay, maybe just a little). 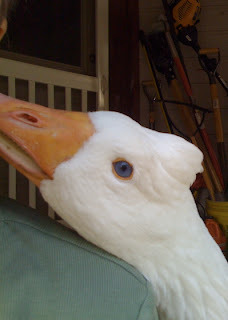 I had discussed with Mom a few weeks earlier that it would be soon when the geese would be flying. "Aren't you afraid that they'll fly away?" "Nah, they know where the easy food is, they won't fly far." Yesterday afternoon, the miracle occurred: some of the geese finally caught air. Queenie and two of the other females flew into the air about ten feet, and forward about 20 feet, crossing the gravel parking spot and driveway. The other geese were astonished and IMMEDIATELY started honking the "hey! wait for me!!" call. The in-flight birds glided down to the ground, and waddled back to join the others, as if nothing happened. It was amazing to watch. D@mn near took my breath away. That moment made all the poopy porch cleaning worthwhile. They have toys. They have real bones to chew, bones half the size of human femurs. They even have the occasional piece of dried frog jerky. The pups enjoy these all, but are they satisfied? No. What do they really like to chew on? Logs. That's right. Wood logs. 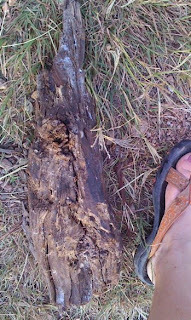 Logs twice the length and width of my size 10 clodhopper feet. Regular downed branches will do in a pinch, but nothing satisfies like a big ol' hunk of wood you've dragged out of the back forty, slobbered and chewed upon, then deposited in the front yard for the geese to run into during their morning flight practice.
" 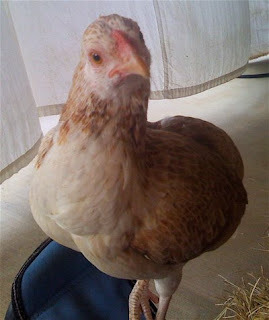 [...] there is something spiritual about chickens and what they do for my soul. They have tiny heads and tiny thoughts and they do their best to get on with their silly day and it's a calming, amusing, endearing sight to witness." 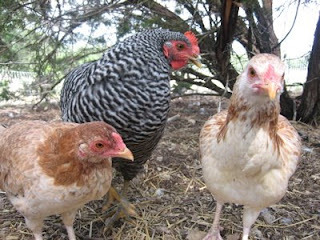 Frau, Cinnamon and Nutmeg have started laying eggs. They make a lot of noise in the process, and I don't blame them one bit: imagine pushing an object larger than the size of your head out of your crotch every morning. Yeah, it's kinda like that. The eggs are small in comparison to commercial eggs right now, but Aunties Jan & Karen (our bestest friends and farm mentors) say that the eggs will get bigger as the girls mature. 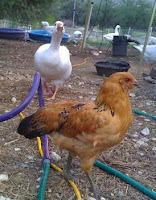 In the egg photo, I've put a commercial "large" cage-free egg on the left. 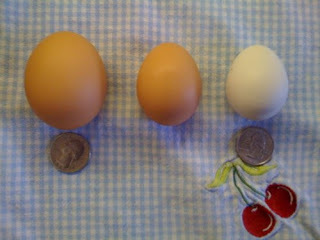 The egg in the middle is from Frau, and the white egg on the right is from Nutmeg. I've also put quarters underneath the eggs for further size comparison. At first, I felt strangely wary of eating those first laid eggs. Chalk it up to being estranged from primary food production for so many years. I got over it quickly, however, and all I can say is "Wow!" You can see the difference in this next picture. 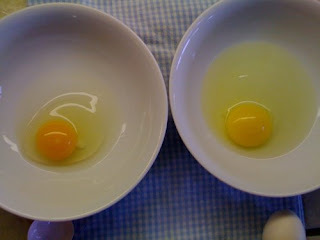 The commercial egg's yolk is pale yellow, with the white looking rather runny. 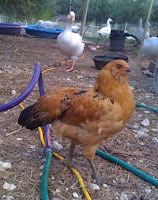 The free-range, pasture/bug/organic-fed chicken's egg yolk is deep orange, and the white is firm. Unfortunately, I can't snap a photo of the difference in taste. The home grown eggs are very rich, almost buttery in flavor. Scrambled eggs are light orange in color. Of course, due to their currently small size, I have to cook three or more home-grown eggs to get the same volume as two commercial large eggs, but the girls are laying daily right now, so quantity is not an issue. On the other hand, when the six Ameraucanas start to lay, the quantity WILL become an issue. We could get up to three dozen eggs a week! May have to see who around us is in the market for non-FDA approved, cook-thoroughly-to-avoid-salmonella, we-take-no-responsibility-for-health-issues-resulting-from these little gems. There's a skunk that is seen from time to time, toddling around outside the building where I work. 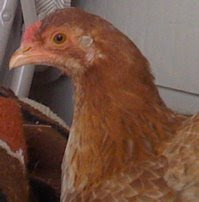 It would seem, according to my nose, that s/he just let loose a goodly spray next to the air-handling system. The office air REEKS. Aiiieeee!!!! 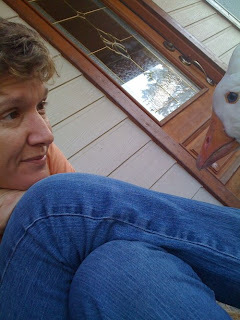 Front-porch conversations with one of the geese. "Meh-meh-meh-meh?" See that look of bliss on her face? She's about to yank the hoop earring out of my ear. Ouch! She's a happy girl. 1. You put aside a set of clothing, maybe two, specifically for farm chores. "Only these clothes will be used for the dirty work", you tell yourself. 2. You are quickly disabused of notion #1, as you find yourself filthy and behind on laundry. Now you say to yourself "okay, any casual clothes like jeans and t-shirts can be used for farm chores." 3. Unexpectedly, sh*t happens and you find yourself running outside for emergencies without thought as to what you are wearing. As you're cleaning up the aftermath, you suddenly realize that you're wearing an interview suit, new shoes, or a party dress. At this point you give up: all clothes have become farm clothes. 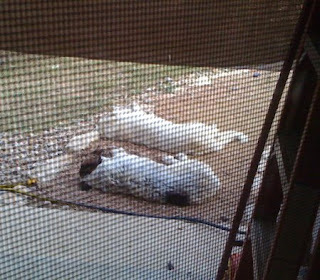 I was teaching the pups to "sit" with leftover, soon-to-go-bad-but-we're-tired-of-eating-them pork ribs. 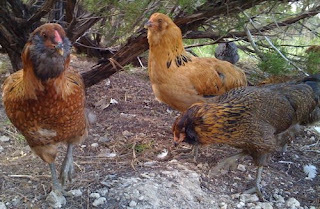 The three head-honcho chickens - Nutmeg, Cinnamon and The Frau - got a whiff of the ribs, and hung out while the pups were chowing down, snagging what little bits of pork were left over and unclaimed. Since this event Nutmeg has decided, it seems, that this should be a Regular and Good Thing To Do. 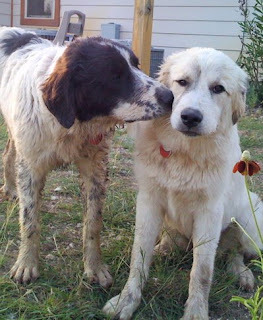 Besides the food, Nutmeg also seems to be identifying with the pups more and more. She'll run after them and hang out while they wrestle. Picking her up and moving her to another location doesn't distract her one bit. She'll run right back to the action. She's quick to get out of the way during the alligator death rolls and other fancy pup moves, but d*mn... about gives me a heart-attack to watch. "Doesn't have the sense that Gawd gave a chicken"... not too sure that's a fair epithet here. From Twitter member TrackingIke: "What a warning: 'Persons not heeding evacuation orders in single family one or two story homes will face certain death.' http://is.gd/2w8E "
WIDESPREAD AND DEVASTATING PERSONAL PROPERTY DAMAGE IS LIKELY ELSEWHERE. VEHICLES LEFT BEHIND WILL LIKELY BE SWEPT AWAY. NUMEROUS ROADS WILL BE SWAMPED...SOME MAY BE WASHED AWAY BY THE WATER. ENTIRE FLOOD PRONE COASTAL COMMUNITIES WILL BE CUTOFF. WATER LEVELS MAY EXCEED 9 FEET FOR MORE THAN A MILE INLAND. COASTAL RESIDENTS IN MULTI-STORY FACILITIES RISK BEING CUTOFF. CONDITIONS WILL BE WORSENED BY BATTERING WAVES CLOSER TO THE COAST. SUCH WAVES WILL EXACERBATE PROPERTY DAMAGE...WITH MASSIVE DESTRUCTION OF HOMES...INCLUDING THOSE OF BLOCK CONSTRUCTION. DAMAGE FROM BEACH EROSION COULD TAKE YEARS TO REPAIR. Spouse's flight to Houston (and then home) from Canada has been canceled, and there's nothing available through the weekend to any airport near home. Although I'm bummed he won't be home, I'm glad he'll be safe. Another gratitude: tonight is my last shift for the week, so I have all day Friday (or at least, for as long as I can stay awake) to get the property prepared for the onslaught of rain. May all in Ike's path be safe. Greens, Grains and Mmm! Mmm! Grubs! 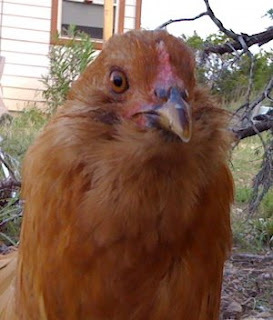 It's safe to say our chickens have a well-balanced diet. We've a full eight acres for them to explore during the day, on which the vast majority of the land grows - besides rocks - loads of wild grasses and weeds for them to eat. 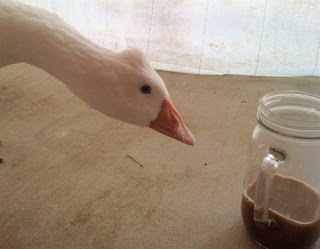 We also provide them a mix of 50/50 organic grains and commercial feed that they share with the geese. Although I'd prefer to give them all organic, it's expensive stuff, so until we can grow our own to supplement, the mix will remain. 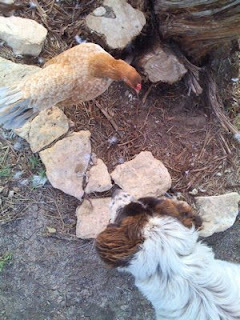 The chickens don't need my help, however, in finding their own grubs. Yesterday afternoon, one of the Cubalayas was scratching at the base of the compost pile. I watched her pick out what I thought was an escaped moldy plum. Walked over to take it away (moldy food is bad for humans and chickens alike), and saw that this was no plum. No, what Cinnamon found was the Mother of All Grubs. Seriously, the grub she found was longer and fatter than my thumb. Pasty white, squirmy, and almost as big as Cinnamon's head. She carried it around for a bit, dropping it here and there, pecking at it like she wasn't sure exactly how to eat this thing. Eventually she took it out behind some bushes, where I hope she swiftly dispatched the grub's life. I, uh, didn't care to witness much more. Mmmm-mmmm! Talk about good eats! 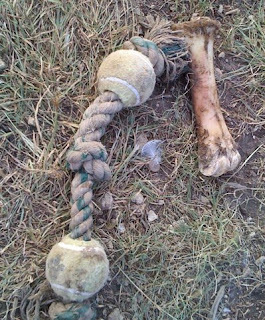 where are my dogs, and what have you done with them? The dogs were calm. They didn't chase the geese or the chickens. They played quietly, and moved about the property with calm grace. What the hell???? I phone-text Spouse: "where are my dogs, and what have you done with them?" "The dogs... they're being GOOD dogs! What did you do?" "You mean they're not bouncing around the geese or chickens?" "Huh. Not sure what's different now..."
We discuss for a few minutes what Spouse had been doing for pup-training while I was away. I hang up, walk outside... a-HA! 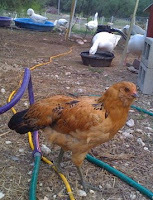 I catch Maggie in the bird pen, having a romp with the Ameraucanas. A quick correction, and then Maggie trots back to Bandit for a wrestling match. Did she overhear the phone conversation, and decide to allay my suspicions that aliens had taken over? Mayhaps, mayhaps. The "family issues" that Spouse delicately referred to in the earlier post was a funeral for my grandmother. She'd been in a long, slow decline for almost a decade, but it's still hard to imagine that such a force of nature is no longer with us. May she be at peace. Spouse was unable to go with me, as we still don't have a backup for critter care. But looky what he found - the Frau has been one busy girl! 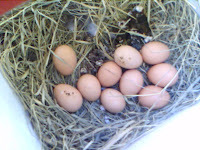 We hadn't expected eggs yet, but yeah, it's about the right time. Life continues onward. Ok -Don't panic. D.A. is out for a few days due to family issues back in Cali and since the dogs can't type a coherent sentence yet (but they are trying- very trying) I guess updates fall to me - the Spouse. I am new to this blogging stuff so please bear with me. Unfortunately, since D.A. took her iPhone there won't be any pics. Not that I would know how to post them or make them look as good as she does anyway. As the saying goes "When D.A. is away stuff happens". After returning from dropping D.A. off at the airport I find that both puppies (all 118+ lbs of puppies) are very happy to see me. However, they arrive at my feet covered head to toe in very dark and pungent mud which is transferred to me as they jump and rub against my legs. I felt like a fence being painted by a short drunk using two dog hair brushes four feet long. I was messy and sloppy from the waist down and I smelled like week old river mud. 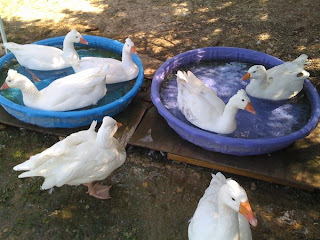 Without cleaning up, I went into the the chicken-goose enclosure to change the water. I immediately smelled a very different horrible smell. Like week-old rotting, putrid - well - I'll just say it was bad. I couldn't figure out what was causing it. Then I saw a cloud of flies by the feed troughs. I wandered over and realized that one of the fly traps had fallen from the post it was tied to. Apparently the fly trap bag had split at the bottom and when I raised it up the rest of the flies escaped to freedom. 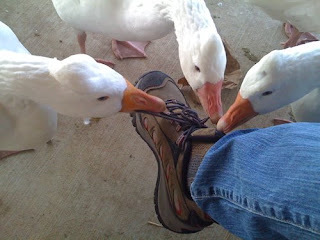 In this case, I must have represented freedom (or another stinky meal) because they started swarming me. If that wasn't pleasant enough, all that smelly liquid fly bait had soaked into the ground where I was standing which brought more flies. So here I am, covered from the waist down in mud- the rest of me is under aerial attack by biting flies and I am standing in a puddle of nasty fly bait. Someone needs to hose down the dogs, the yard, and me. D.A. has been gone a grand total of 2 hours...maybe I should panic. Labels: D.A. is out - prepare for trouble. Chicken got wise to what was happening, and took off before the goose got too close. 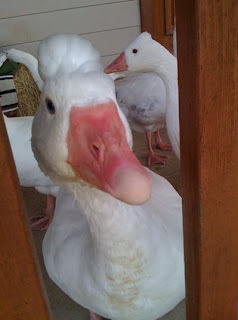 Rotten goose! Rotten!